A new job or career? Marriage? A lifestyle change? Mastering a skill? A creative accomplishment? An athletic triumph? Your dreams are often far more within your reach than you realize. God has ordained each of our lives to certain accomplishment, Blaine Smith stresses. He has given us the capacity to dream big -- and those dreams that stand the test of time are often a vital indication of what he wants us to do with our lives. We must not be too inclined to “play it safe,” but need to stay open to new steps of faith. 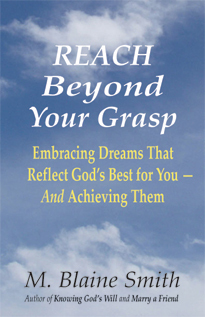 In Reach Beyond Your Grasp Blaine Smith provides a strong mix of encouragement and practical help for taking these steps and putting your dreams in motion. He examines the positive role of desire in the Christian life, which so often is neglected in Christian teaching. He looks carefully at problems we face in finding permission to embrace our heart’s desires. And he encourages us to continue to think big and pursue fresh dreams for as long as God gives us the ability. Reach Beyond Your Grasp will give you the heart to reach that new horizon, and the know-how to do it. It’s time to expand your sights and embrace God’s bigger picture for your life!